NESTA-NMR performs a reconstruction of non-uniformly sampled (NUS) NMR data using the NESTA first-order gradient descent method of Becker, et al. , which is based on a method proposed by Yuri Nesterov . NESTA-NMR contains three regularization terms: \(\ell\)1 (L1) , iteratively re-weighted \(\ell\)1 (IRL1) , and Gaussian smoothed \(\ell\)0 (Gaussian-SL0)  normalization. See the section on regularization for more information on regularization terms. The reconstructed data can then be processed with NMRPipe  in the regular fashion. NESTA-NMR works on NUS data that are two-, three-, or four-dimensional (2D, 3D, or 4D). NESTA-NMR has been designed to integrate with the popular NMRPipe program. 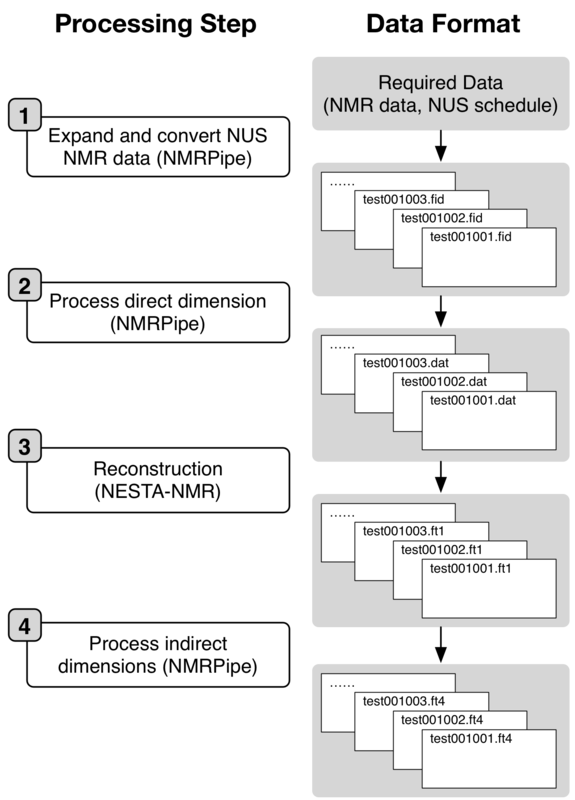 Processing NUS data with NESTA-NMR can be accomplished in four steps, only one of which is not required to process uniformly sampled multidimensional data with NMRPipe. An outline of this workflow is illustrated for a 4D example in the figure below..
Flowchart for processing 4D NUS data with NESTA-NMR. For general use, L1 regularization is recommended because it produces excellent results with modest computational time. The default number of iterations, \(\mu\), is 30 and should be used in most cases. If increased speed is important, the number of iterations can be reduced to 15, albeit with slightly worse convergence rates. It can also be increased, although improvement of convergence rates can be limited. For spectral regions where recovery of peaks with weak intensity or extremely accurate intensities is important, IRL1 or Gaussian-SL0 are recommended. In our experience, both of these two regularization terms increase computational time relative to L1. For IRL1, it is recommended to reduce the iterations to 15 (from the default of 30) and then use 5 re-weighted iterations. For Gaussian-SL0, the number of iterations used should be around 5000, the scaling should be set to 0.98, and the cutoff to 0.1. For tighter convergence with Gaussian-SL0, the scaling can be increased to 0.99, but the iterations should also be increased in this case. The tutorial included with NESTA-NMR as well as figure 6 of Sun et al. contains a comparison of the reconstructions resulting from these three regularization terms.